British Airways made an announcement yesterday that the airline would resume its Tehran service after withdrawing from the market in October 2012. 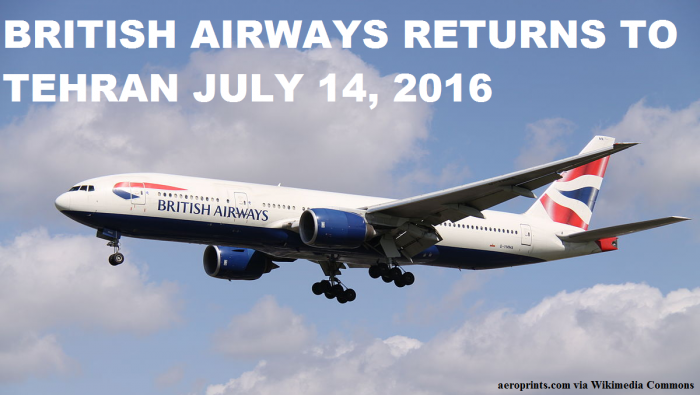 The airline will launch six fights a week starting on July 14, 2016, on a four class Boeing 777. The airline will have daily service starting next winter. Seems that the flights are wide open right now. The route will launch as a six-per-week service before moving to daily flights from winter 2016, giving customers even more choice and flexibility between London and the Middle East. The service from Heathrow Terminal 5 will be operated by a four-class Boeing 777. Neil Cottrell, British Airways’ head of network planning, said: “Iran is a large and growing economy and Tehran is a brilliant business city so we are incredibly excited to be adding another gateway to the Middle East for our customers. The airline has a long history of flying to the city and offered the first scheduled flights between London and the Iranian capital in 1946. Tehran is one of 14 new routes British Airways will be launching this year, which include San Jose, Costa Rica, San Jose, California and Lima in Peru. Return fares start from £384 for World Traveller, £728 for World Traveller Plus, £2163 for Club World and £3763 for First. As well as being a bustling business centre, Tehran is a treasure chest of mosques, fortresses and temples and the city’s Tachara Palace is world-famous for its stunning architecture. Culture vultures can visit the ghost town of Koporak in Yazd, skiers can head to the slopes in Tochal, and savvy shoppers can explore the maze of bustling alleys and stalls in Tehran’s oldest and biggest bazar. I paid a brief visit to Tehran last year and wrote about my visa-on-arrival process here. I had planned to visit other cities as well, but had to cut my trip short due to internet connectivity issues. You should bear in mind that visiting Iran may have consequences if you plan to visit United States under the visa waiver program (read more here). Tourists that visit Iran are required to apply for US visa and are not eligible to enter under the visa waiver program.